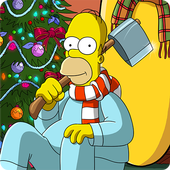 It's snowing in Springfield which means only two things... global warming hasn't hit mobile games yet and "A Simpsons Christmas Special" has arrived! Join the Simpsons Family as Homer, Marge, Bart, Lisa and Maggie all share their very own Christmas tales in this 4-part event! That's right - 4 times the fun and 4 time the presents! That's even more than kids of divorce get!